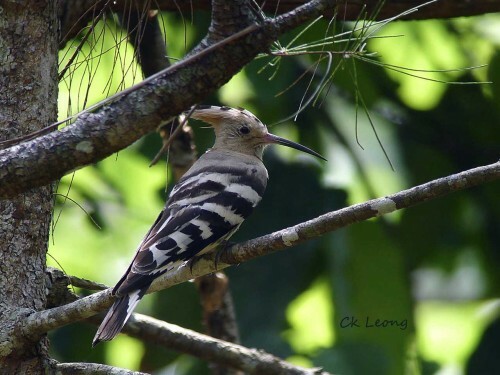 Many years ago while visiting the island of Lankayan off the north-east coast of Sabah, a security personnel stationed there described to me what must be the Common Hoopoe. Since then I have seen this bird on many occasions on my travels on mainland Asia. But my wait to see the bird on my own shores only ended this morning on Pulau Tiga, an island park south-west of Kota Kinabalu. It was displaying its normal habits – walking on the ground, probing with its very usable long bill, and when I got too closed, taking off in its characteristic undulating flight. I did not hear its oop oop oop call from which it got its English name but I wasn’t really listening. It is not every day one gets to see a rare vagrant. Special thanks to Chris Kehoe and Osman Saman.